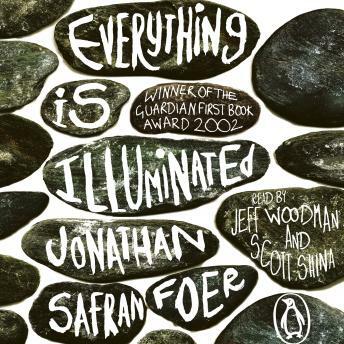 Penguin presents the unabridged, downloadable, audiobook edition of Everything is Illuminated by Jonathan Safran Foer, read by Jeff Woodman and Scott Shina. A young man arrives in the Ukraine, clutching in his hand a tattered photograph. He is searching for the woman who fifty years ago saved his grandfather from the Nazis. Unfortunately, he is aided in his quest by Alex, a translator with an uncanny ability to mangle English into bizarre new forms; a "blind" old man haunted by memories of the war; and an undersexed guide dog named Sammy Davis Jr, Jr. What they are looking for seems elusive -- a truth hidden behind veils of time, language and the horrors of war. What they find turns all their worlds upside down.